Combining vintage inspired style and luxury design, this stunning patterned ring from the Neil Lane Designs collection is crafted in shining sterling silver and set with 0.16ct carat of diamonds. Neil Lane Designs are uniquely beautiful. Vintage inspired, handcrafted jewellery by prestigious Hollywood designer Neil Lane Designs. 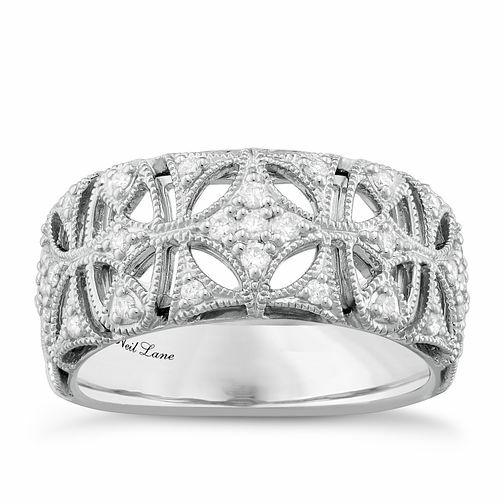 Neil Lane Designs Silver 0.16ct Diamond Vintage Band is rated 4.7 out of 5 by 6. Rated 4 out of 5 by Anonymous from Classy and eye catching I wasn’t sure about this ring when I first ordered it online but once it arrived I wasn’t disappointed. It just the right width for me and the band really suits my finger. Neil Lane designs classy and eye catching timeless pieces, and this is definitely one of them.